Thank you for your input. Being a novice collector I was unaware that oriental ceramics could be so complicated. I have tried to supply the images you require but should you require more then please explain exactly what it is that you require and I will do my best to oblige. Peter, thanks again for input. I have checked the entire foot rim and at first thought that it was just worn down. However on inspection with a magnifying glass I can see that it has been painted over brown to make it look old!! I have therefore got to accept that my plate is not all that I had thought it was which is unfortunate. It will not now be going to Sotheby's to make me a fortune but rather into my display cabinet to give me visual satisfaction. What Tim meant with "black ships" is pointing to the American black ships that forced Japan to open up to external trade in the 19th century. I agree with him, very strange indeed on a Chinese marked plate. In addition, the enlarged bottom shows that the foot rim was possibly artificially darkened. In 90% of all cases this means a fake trying to look antique. Even dirty foot rims don't get that color, usually. 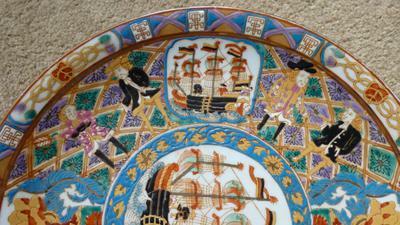 This and the above mentioned fact of the ship decoration makes it probably that your item isn't antique, I'm afraid. 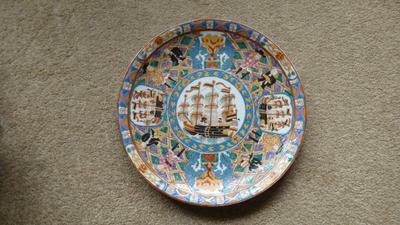 Hi, I have recently found and purchased the plate which I have included the pictures of. 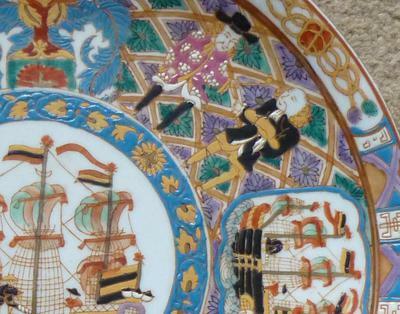 What caught my eye was the Qianlong mark but more than that the images depicted on the plate which appear to tie in with the period 1736 - 1796. Could anyone advise me on the authentication of my plate. Thank you. John Smith. 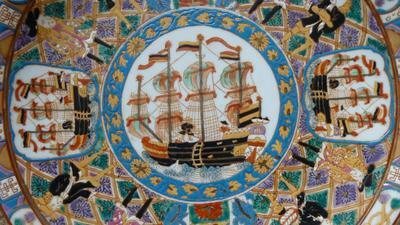 with a Qianlong mark or a Chinese plate with a Japanese design. Need more close ups of bottom and foot rim. First to the pictures, not close enough. 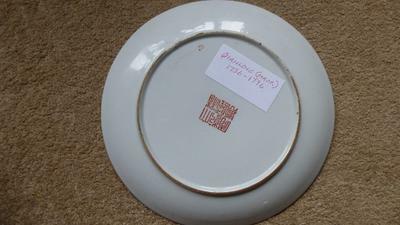 But, it looks as if the mark was on-glaze enamel. This is usually a sign that it was later made. 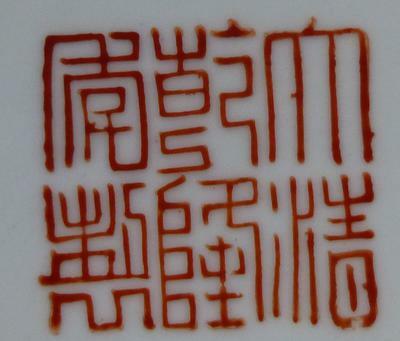 Qianlong marks rarely were made that way. The subject of this plate is known to me, but I never had an opportunity for seeing one, actually. 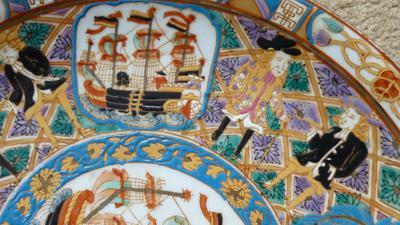 There are many modern fakes; plates with the same or similar subjects are also sold as being Japanese. I assume this is a later product.